I think that duck hunting season is finally over at Occoquan Bay. It has been somewhat jarring in recent weeks to have my photography expeditions to the wildlife refuge interrupted by volleys of shotgun fire, sometimes at rather close range. 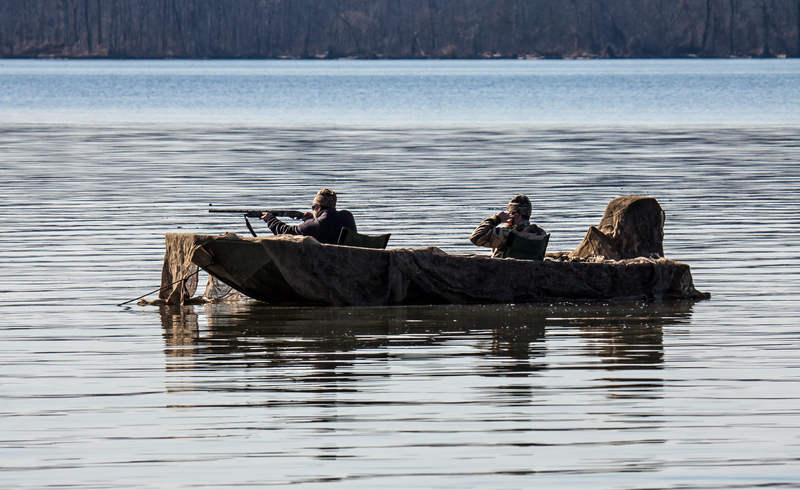 In addition to some fixed blinds in the water that look like tiny cabins on stilts, hunters also use small boats like the one featured in these two images. 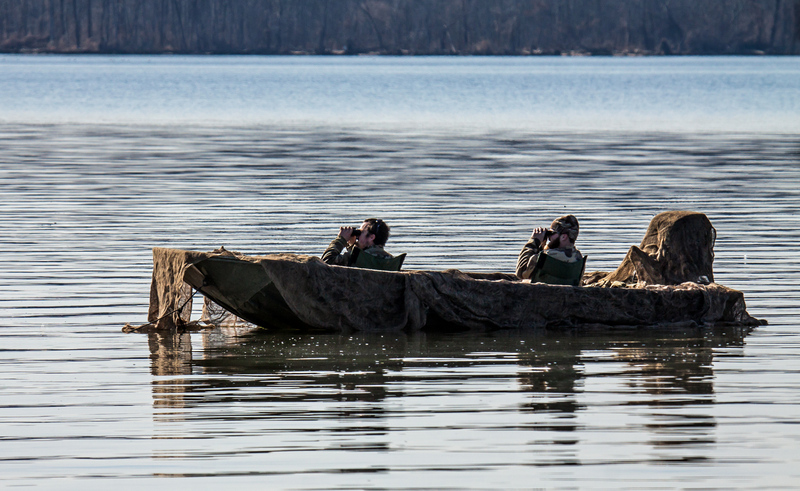 The two hunters in this boat were so close to the shore that I had to zoom out to about 250mm on my 150-600mm telephoto lens to be able to fit them into the frame. 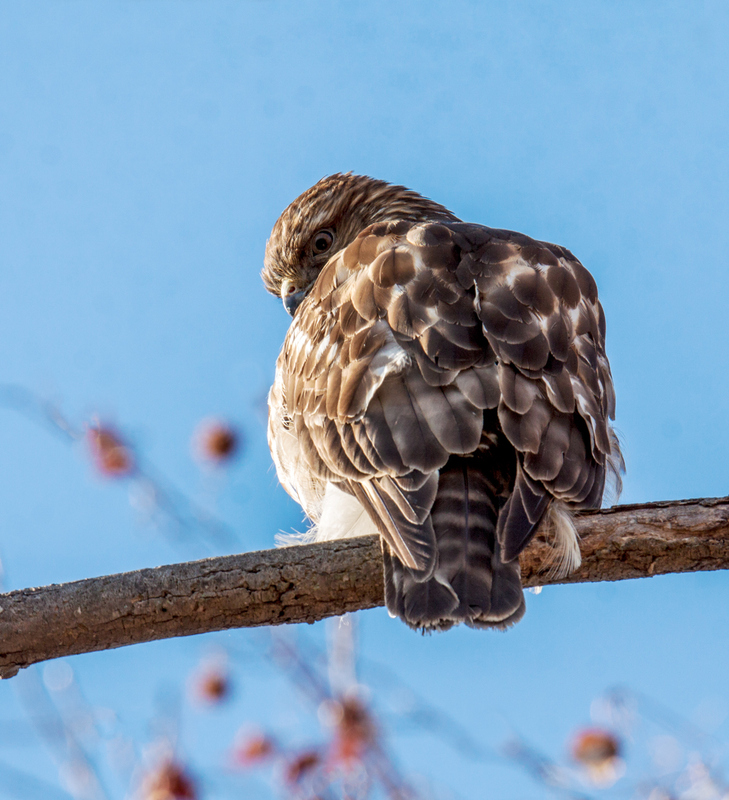 I have already featured a frontal image of this young Red-shouldered Hawk (Buteo lineatus) that I spotted last Friday at Occoquan Bay National Wildlife Refuge, but I decided I also really like this shot in which it is looking over its shoulder. The hawk definitely was keeping an eye on me after I had passed almost directly underneath it and was walking further down the path away from it. In a strange way the hawk seemed to be simultaneously intensely focused and quite relaxed and was quite content to remain on its perch. Reduced to its essence, photography is all about light and shadows. 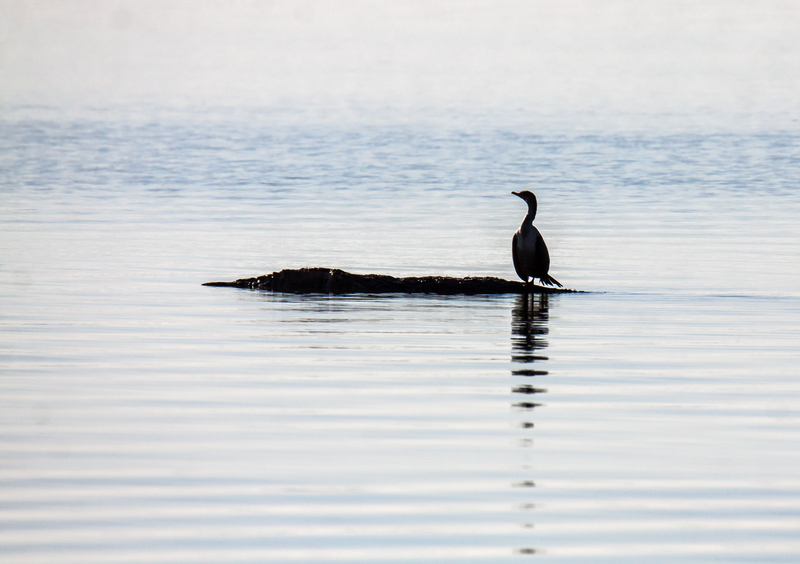 Sometimes details are not even necessary to evoke a mood, a sense of the moment, as in this image of a Double-crested Cormorant (Phalacrocorax auritus) that I captured this past Friday at Occoquan Bay National Wildlife Refuge. 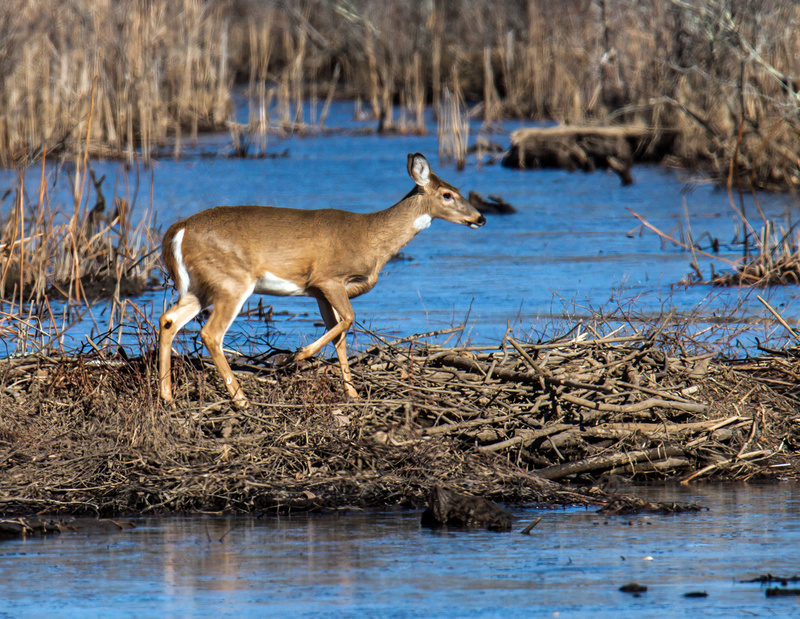 I spotted this White-tailed Deer (Odocoileus virginianus) this past Friday at Occoquan Bay National Wildlife Refuge as it carefully made its way across one of the small streams that crisscross the refuge. 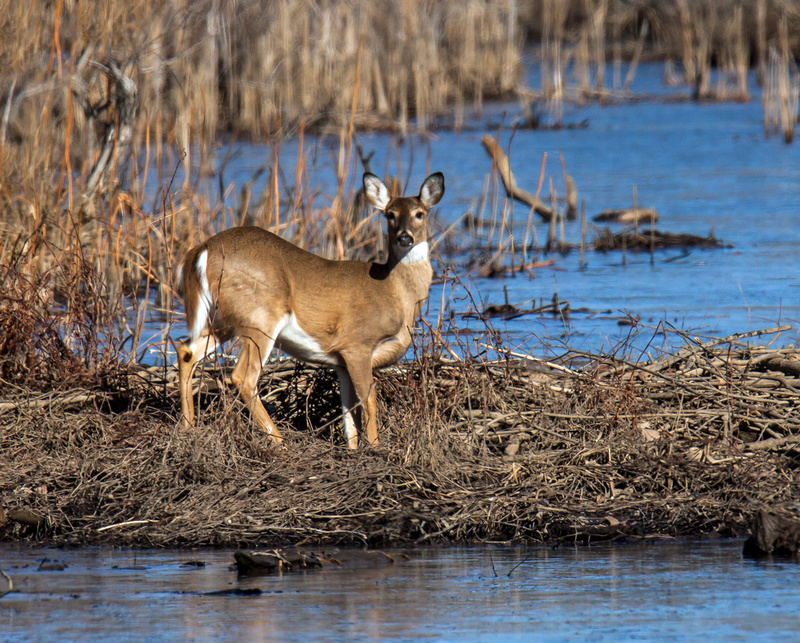 This deer was lagging behind a small group of four deer that I initially spotted. That group pretty quickly and I was not really ready for them, so my photos were not that good. I was quite happy when this final deer appeared and I was able to get some shots. 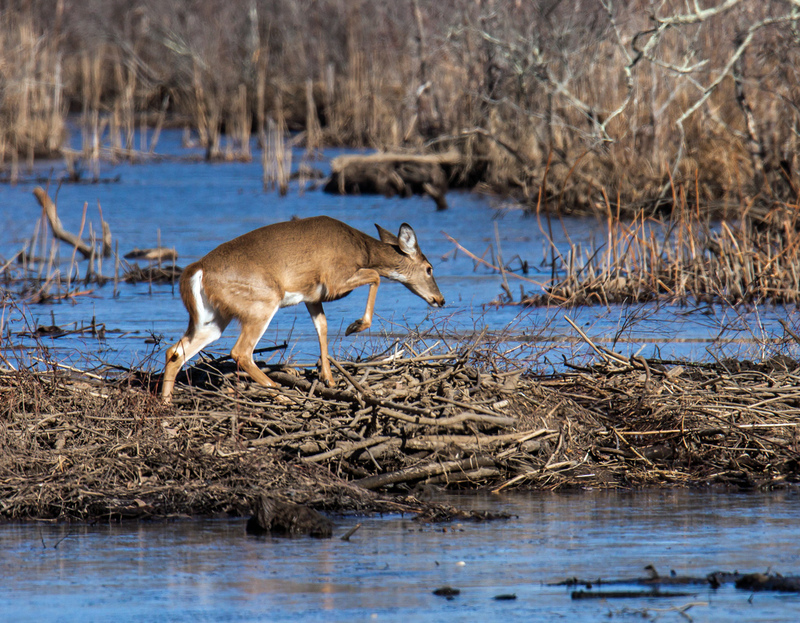 I couldn’t tell for sure how stable the footing was where the deer was crossing, but the deer did appear to be very careful as it chose places to place its feet. 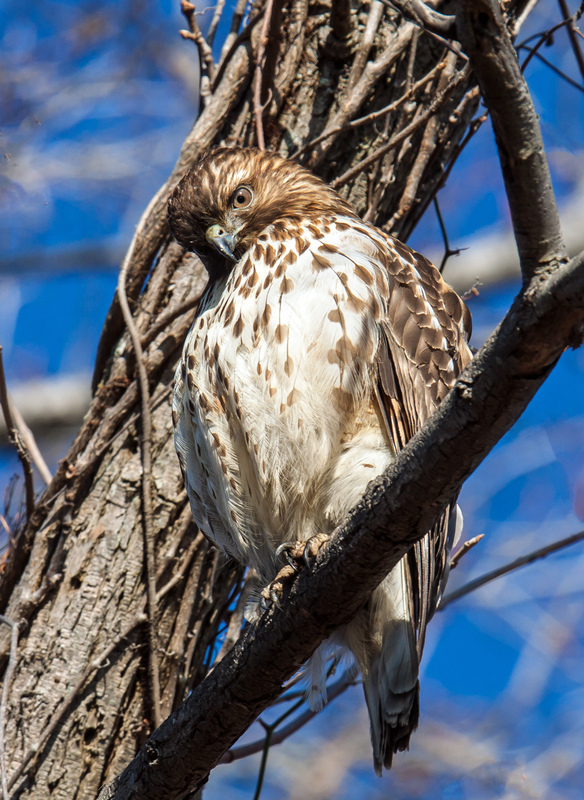 This young Red-shouldered Hawk (Buteo lineatus) stared down at me with curiosity and interest yesterday at Occoquan Bay National Wildlife Refuge and stayed in place even when I passed almost directly beneath it. In my experience, younger birds are more likely than adults to hang around as I approach. As they grow older, I suspect, they rightly come to view humans as potential predators. 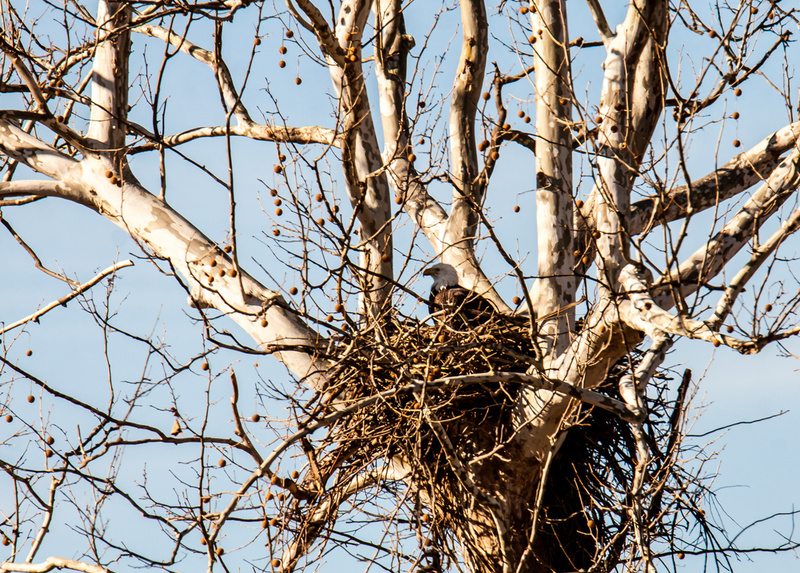 From a distance I was able to catch a glimpse of a nesting Bald Eagle (Haliaeetus leucocephalus) last week at Occoquan Bay National Wildlife Refuge. I love the way that this shot shows the awesome structure of the tree in which the eagles built their nest. As I mentioned in an earlier posting, officials at the wildlife refuge have blocked of roads near this nest to keep the eagles from being unnecessarily disturbed by human activity. I captured this image from behind the barriers. As nesting activity continues, I suspect that the barriers will be pushed even further back, so I decided to get this shot while I was still able to do so. Once I was aware of the presence of the eagle in the nest I attempted to be as stealthy as I could in approaching the barrier, which is a little tough to do when you are standing in the middle of a wide trail with fields on both sides. I stayed low and left after I had taken a few shots. Is this love or anger or a bit of both? 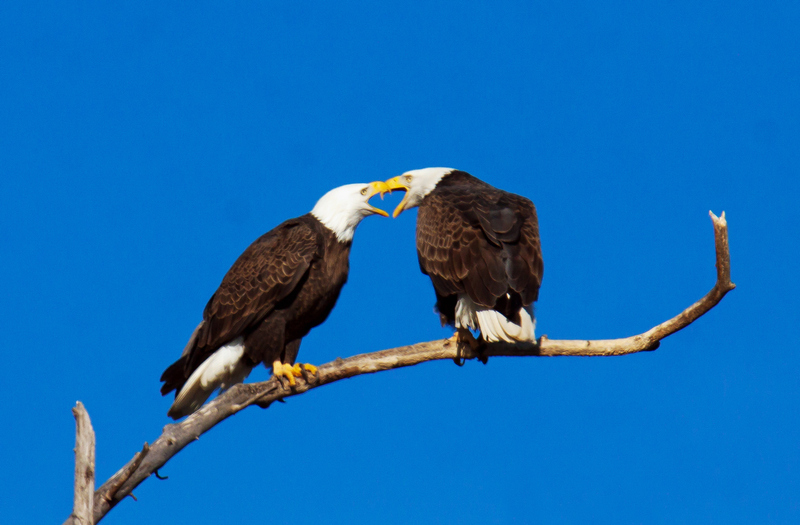 Relationships of any sort are complicated and I don’t know enough about eagle behavior to interpret the interaction between these two Bald Eagles (Haliaeetus leucocephalus) that I observed one morning last week at Occoquan Bay National Wildlife Refuge. Sharp-eyed reader viewers may have noted that these two eagles are perched on the same branch where I previously photographed an eagle couple. The branch is part of a tree in which there is a nest that I am now relatively certain is an eagle nest. It is a pretty good distance off of the path and partially hidden, so I am hoping that the wildlife will judge that passing humans won’t unduly disturb what may become nesting eagles and will leave the path open. As for the behavior, I must admit that I am a bit romantic and couldn’t help but note how the space between their beaks forms a heart. I’m voting therefore for love.